Cast iron pipe is generally used in sewer lines. The following points should be kept in view while purchasing CI pipes. The pipe should bear ISI marks and must be heavy duty pipe. The pipe must be free from pinholes, cracks and has a good finish. The leakage should be checked by erecting the pipe temporarily in earth and filling it with water up to the top. If there is any hole or crack in the pipe, the water will come out. Hence the pipe should be rejected. All CI pipes and fittings should give clear ringing sound when struck with light hand hummer. All CI pipes and fittings are hot, dip coated inside and outside the tar/bitumen coating. Heavy Duty PVC pipes are also equally good if used with proper jointing and care while designing. These pipes have 50% more life and are cheaper than C I pipes also. The quality of material is checked with rates at least from three to four shops while surveying the market for purchasing the material. The rates of all required items are verified once; not for main item as the shopkeeper may tell fewer rates for main item/pipe etc. and charges more rates on other items in later. Accessories of good quality are purchased after verification of sample. Ensure whether the durability of any accessory is more and guaranty is obtained from shopkeeper. 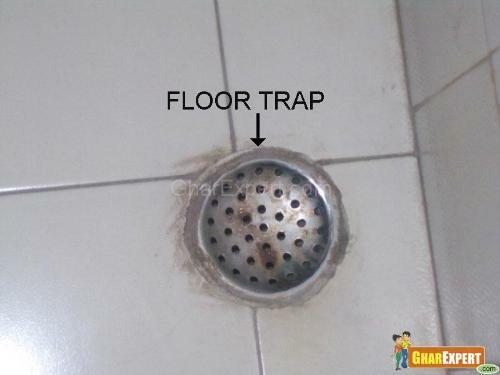 Generally it is observed that the top of floor trap is not fixed by taking proper level of floor of the building; which creates problems of drainage. Floor trap should be fixed after marking proposed floor level. The top of floor trap in toilet and kitchen should be 12 MM to 20 MM down from floor level of the building to provide proper slope for easy drainage of water. Where sewer lines cross the road or drain, they should be passed through CI or RCC pipes. The greater the depth of seal is, the more effectively it will prevent foul air to come to the house from sewer. Waste pipe should be connected through gully trap in main hole. If it is connected directly, it gives foul smell. In sewer line, the following minimum gradient /slope should be provided for self cleaning. Sewer line should be checked well before layout of floor otherwise any leakage will damage the floor and foundation of the building. Close sewer line at one side by using gunny bags, cement mortar, and fill the pipe with water on other side. Wait for 24 to 48 hours. If there any leakage, the water will come to the surface of pipe or in the joints of pipe. After checking leakage, the top of pipeline should be covered with cement concrete. A class stoneware glazed pipe must be used in sewer lines. Now a day UPVC pipes also are being used in sewer lines; which are durable and low in cost. Join date: May 2014 The pipes and fittings has to be of PN20 grade not PN16. Also make sure that you buy a good brand with ISI mark on it.